This week i will attend an AIR Summer Camp in belgium. I will talk about Bits And Bytes with AIR and give some insights to RichFLV and RichMp3. I`ve prepared a lot of samples and plan to post them along with my presentation later this week. 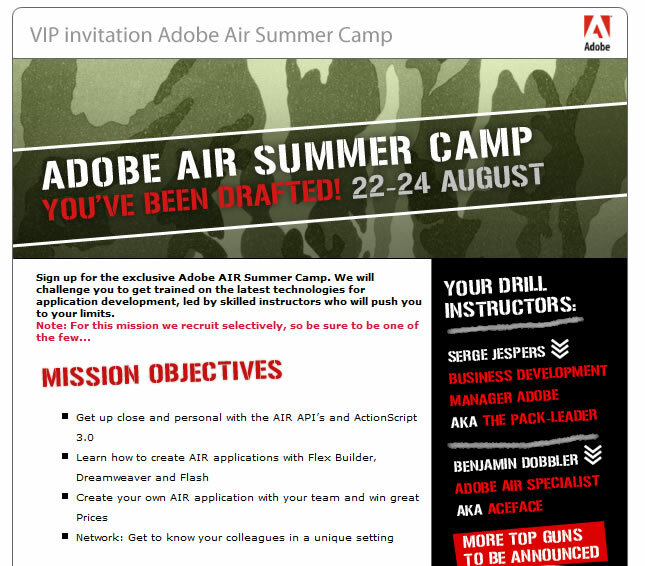 The Adobe Beneluxe Team seems to do quite a good job in promoting AIR wonder why it`s so quite here in germany ? @Phillipp: Mmyeah… totally my fault. @Benjamin: Glad to have you on board dude! Just wanted to let you know I really enjoyed your presentation and superb paintball skills last week! The Lost Born Dobbler Republic rules! If you have any pictures could you email them to me?